The Department of Defense offers EFMP Resources, Options, and Consultations through Military One Source 24/7. To support an all-volunteer force and their families by ensuring Family members’ medical and educational needs are considered each time they process for an assignment where Family member travel is authorized at Government expense and related services are available within the local commuting area. Spouses and children of Service Members (Active Duty, USAR, AGR, Title 10, Title 32) from all branches of services, who have medical conditions (physical, emotional, developmental, or intellectual) which require specialty care and also those who have special education needs. DoD EFMP Required Actions: Medical enrollment (DD Form 2792) signed by physician. Medical and Educational Enrollment (DD Form 2792-1) signed by a school for those who have an Individualized Education Program (IEP). Educational Enrollments are always and only considered for OCONUS. 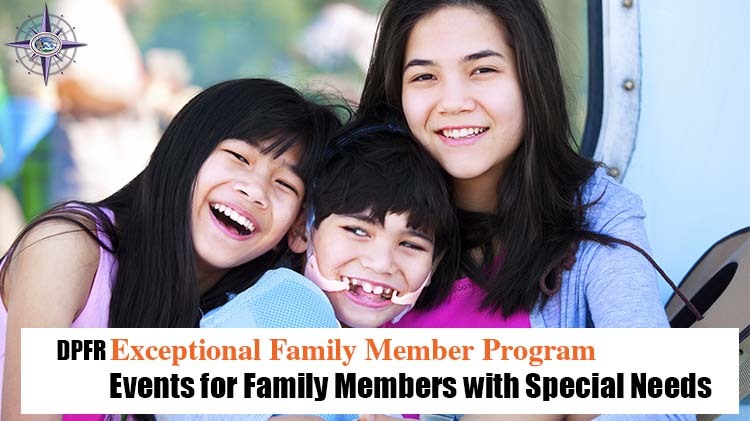 EFMP Family Support Services: Offers specialized support to EFMP families on and off base with access to care, school support with special education and accommodations, federal and state benefits i.e. Social Security and Medicaid waivers for respite, inclusive and specialized recreation opportunities. DoD EFMP Required Actions: Renew Enrollment every 3 years, for new diagnosis, if a change is needed to housing accommodations, specialists, and/or how often. Disenrollment may occur for divorce (court order provided), a child is no longer DEERS recipient or in the home, or when ongoing healthcare and/or school special education services are no longer required. EFMP Family Support Services: Services are elective and may be accessed at any time. Service members are invited during in/out processing to provide their Family POC contact information to offer specialized support. Where can I find EFMP Services? DoD EFMP Required Actions: Military Treatment Facility, Madigan Army Medical Center Tower for Army and McChord Clinic for Air Force. EFMP Family Support Services: Directorate of Personnel and Family Readiness for all branches (formerly known as Army Community Service and Armed Forces Community Service).